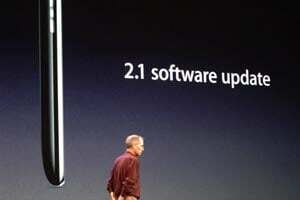 Apple has just confirmed that the latest iPhone Software Update, version 2.1 will be released this Friday. The iPhone 2.1 Software update will fix some of the bugs, including dropped call, fewer crashes and a big battery improvement. There will also be faster backups, lets hope so it is taking me ages to back mine up and sync it, and lets hope that the extra battery life will be a big improvement as I am constantly charging mine, and the battery life is considerably worse than the 2G iPhone.